The original Tron, released in 1982, and starring Jeff Bridges and David Warner, is wholly of that era and yet it feels timeless. Some of that is the perpetual 80s nostalgia we’ve been living in for a good eight years (and codified in our daily breathing exercises in 2011, thanks to Drive). But some of it is also that the film’s politics, religion, and fear of technological inventions is an ongoing concern today. Bridges is Kevin Flynn, a cool-cat former programmer with computer company ENCOM (The dude abides, even 15 years before The Dude is The Dude). He’s been sidelined by Ed Dillinger (Warner), a top executive at the company who made his way to higher echelons of power by stealing Flynn’s video game ideas. Flynn’s been trying to break into the company’s main computer system virtually to find the proof of Dillinger’s malfeasance, but the autonomous, HAL-like Master Control Program has made sure not to allow such things to happen. Besides, MCP is too busy trying to break into the networks of the Pentagon, the Kremlin, and other consequential computer systems in an effort to absorb all of the software he can get into himself. He doesn’t need Flynn messing about. Meanwhile, Flynn’s pal, Alan Bradley (Bruce Boxleitner), has programmed security software called Tron. At one point, Flynn convinces Bradley and their friend and colleague Lora Baines (Cindy Morgan) to help him break into the ENCOM headquarters after Flynn’s own program, CLU, fails in its bid to find the secret files pointing to Dillinger’s intellectual property theft. Flynn succeeds to a point. They break in and he finds himself in front of the computer, ready to implement some special hacking tomfoolery, when the MCP gets upset and beams Flynn into the computer world. 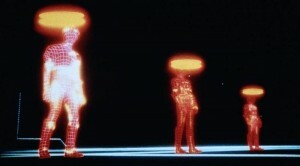 Although Tron isn’t merely Oz updated for the 80s generation, that it is a product of its time is apparent. The oppressive MCP, while a mere HAL-like hacking program in the real world, in The Grid is a Stalinistic dictator and his second-in-command is a program that is a reliable party-secretary-in-waiting. Flynn and his cohort are the American liberators in the Soviet hellscape. Hell, the bad guys are even embellished with red neon if the distinction weren’t clear enough. The contrast of America’s political system and that of Russia’s is also on display in the response to some programs’ religious devotion to their “user,” the human in the real world who — at minimum — gives the program instructions, or has even created the program. MCP and his comrades mock the “religious” and seek to undermine the credibility of the false gods. The Americans are the pious and the Russians are the heathens. Oops, I mean the good guys are the pious and the bad guys are the heathens. There. That’s better. The other element — fear of our own creations, or our own creations’ inevitable awareness and revolution against us — is also on display. The MCP, echoing HAL, is a malevolent creation. He originally started out as a chess program and become more powerful but maintained some benevolence. When Dillinger came into the equation, he set MCP on an ignoble path. MCP’s conquest of various important computer networks foreshadows the artificial intelligence prowess of Skynet from The Terminator, although MCP isn’t yet ready for mass homicide. It also echoes the ongoing fear of the era of the Soviets somehow getting control of the American defense network, or just a general fear of the unknown harm that could be perpetrated by the relatively new technology of personal computing and widespread networks. 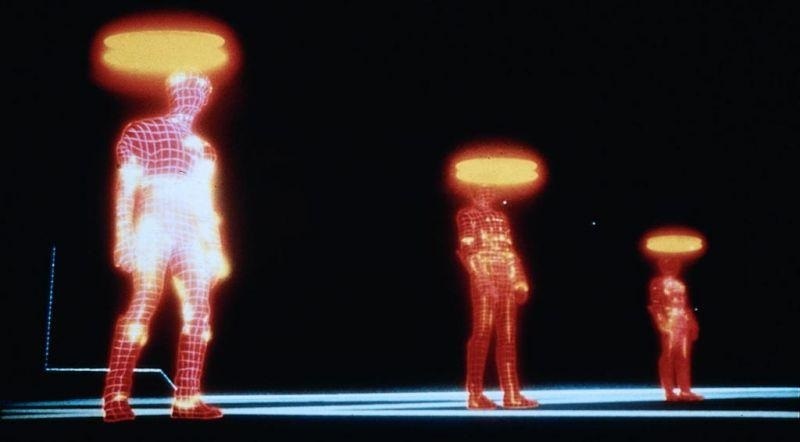 All of those considerations, which make it an 80s film, don’t necessarily date Tron. Neither do the somewhat laughable special effects, a then-groundbreaking mix of back-lit animation and computer graphics. Today, the graphics are co-opted frequently by musicians and graphic artists in the 80s retrosynth/synthwave scene as part of the overall tour-de-force of nostalgia for the decade. The political contrast, though altered somewhat, is still a concern: Although we’ve grown tired of the news about Russia invading the Ukraine, that event overall solidified a renewed breakdown in Russo-American relations — much to the pleasure of pols and pundits rendered obsolete by “The End of History.” Nowadays the religious battles are scarier than ever, what with ISIS and Al Qaeda and their lot. The funny thing is that for an 80s film, and one of this character, the soundtrack is utterly lacking in the synthesizers sacred to the eras premiere composers, such as John Carpenter, Giorgio Moroder, and Harold Faltermeyer. This is legitimately ironic, given that Tron composer Wendy Carlos was a pioneer in using synthesizers for classical compositions.